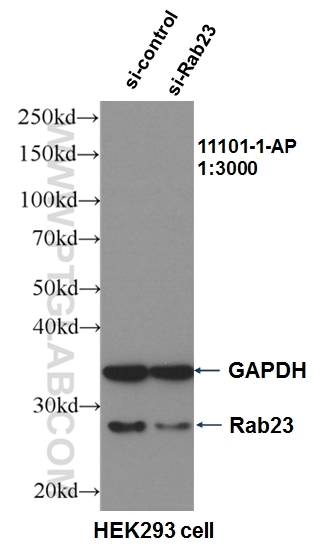 WB result of RAB23 antibody (11101-1-AP, 1:3000) with si-Control and si-Rab23 transfected HEK293 cells. 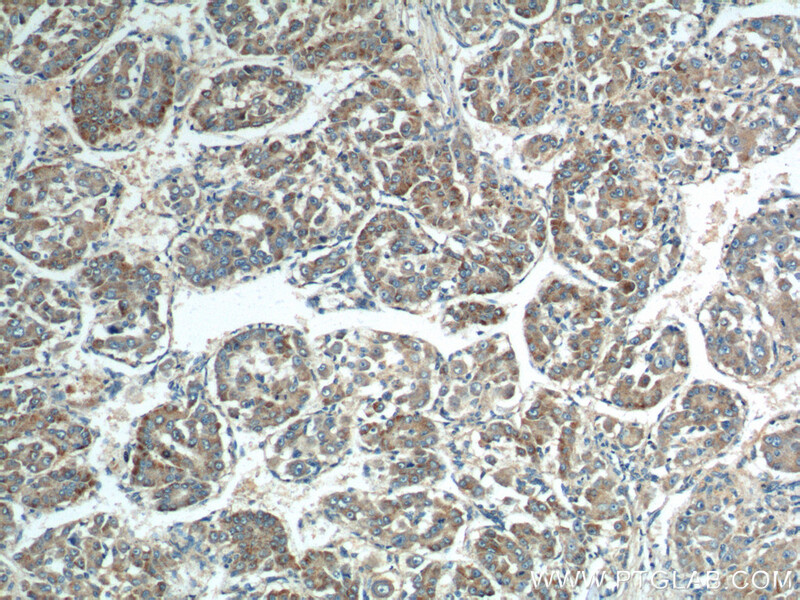 Immunohistochemistry of paraffin-embedded human liver cancer tissue slide using 11101-1-AP( RAB23 Antibody) at dilution of 1:200 (under 10x lens). 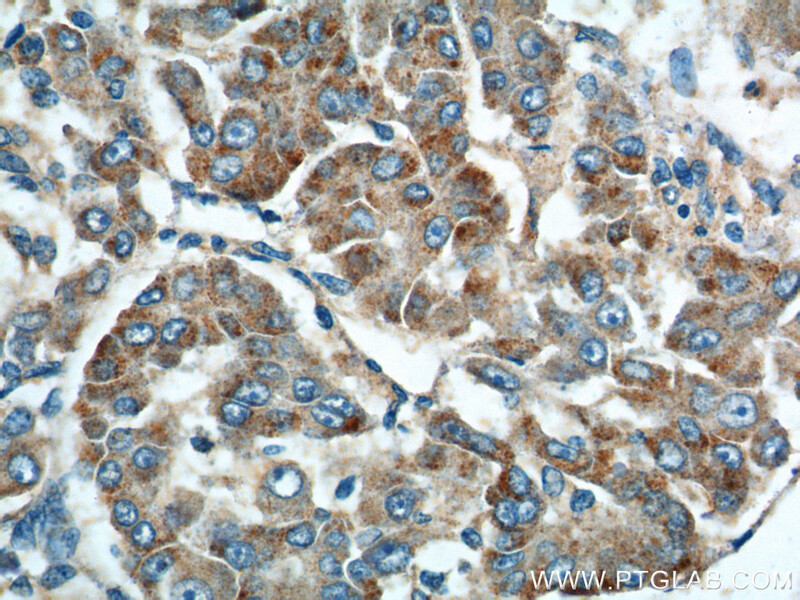 Immunohistochemistry of paraffin-embedded human liver cancer tissue slide using 11101-1-AP( RAB23 Antibody) at dilution of 1:200 (under 40x lens). IP Result of anti-RAB23 (IP:11101-1-AP, 3ug; Detection:11101-1-AP 1:1000) with mouse brain tissue lysate 7000ug. 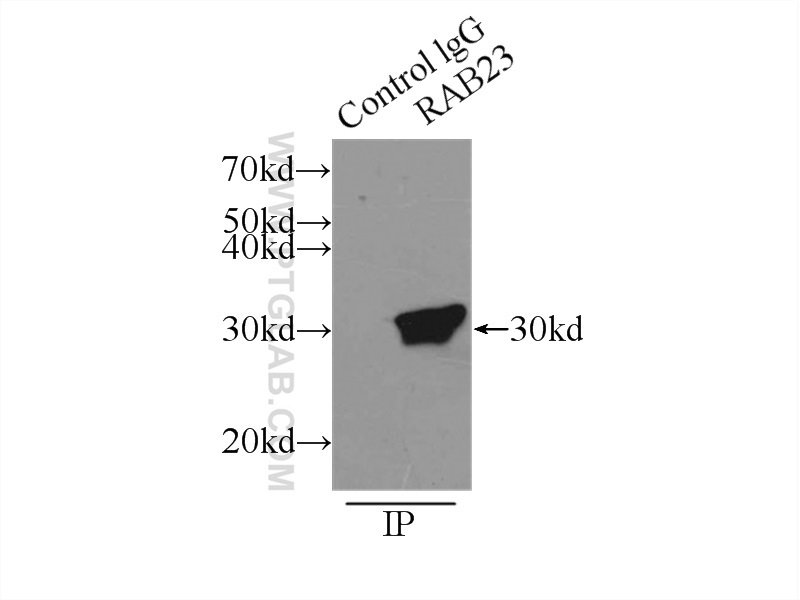 Rab23 is a novel member of large Rab small GTPase family. It plays important roles during embryonic development. The brain-enriched Rab23 is the only Rab protein that is known to have a distinct function during central nervous system development, playing an essential role as a negative regulator of the Sonic Hedgehog (Shh) pathway. RAB23 has recently been identified in mesangial cells (MCs), and could serve as a biomarker that indicates the severity of FSGS ( focal segmental glomerulosclerosis). Mutations in RAB23 may result in ACPS2 ( acrocephalopolysyndactyly type 2). Differential role of Rab proteins in ciliary trafficking: Rab23 regulates smoothened levels. Rab23 promotes squamous cell carcinoma cell migration and invasion via integrin β1/Rac1 pathway. miR-338-3p targets RAB23 and suppresses tumorigenicity of prostate cancer cells.